The crown brasses are all fitted to the axleboxes and machining has progressed to the stage where white metalling is looming on the horizon. Machining of the steam chest liners is underway. The ashpan approaches completion. A visit to Buckfastleigh at the end of April found that all the crankpins are now fitted to the driving wheels but balancing of the wheelsets has yet to be carried out. 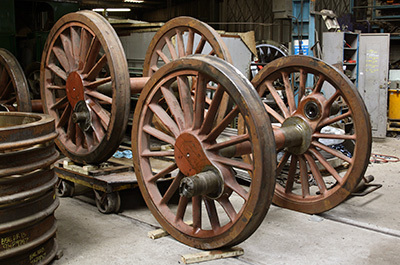 We are hopeful that the wheelsets can stay under cover at Buckfastleigh for a while longer until we have the axleboxes ready for them at Bridgnorth. The top frame for the rear pony truck has now been cast and we are very grateful to the Standard class 2 project at the Bluebell Railway for their development work on this component prior to casting. 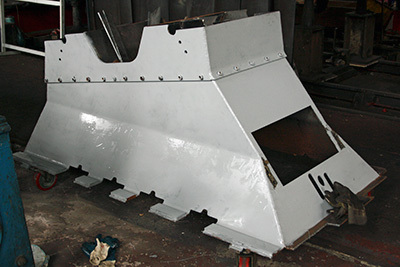 Various items are on order such as the smokebox wrapper, patterns for chimney and superheater header and patterns for all the end covers on the cylinders and steam chests. The main emphasis continues to be on the boiler appeal. At the time of writing, this stood at approximately £183,000, so we are well on course to reach our target of £200,000 by the end of the year. 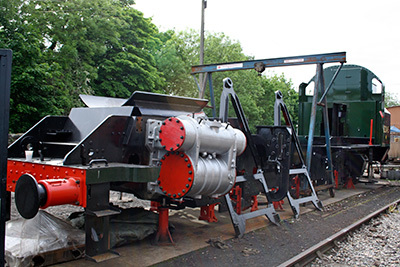 We may get away with under £300,000 for the boiler and firebox particularly as the SVR boiler shop manager has agreed that the 82045 team can work alongside his chaps at certain stages of the build, doing such jobs as drilling and tapping, which are time consuming and therefore costly if we had to pay for them. However, we can't afford to be too confident about this big job and continue to aim to raise £300,000 by the end of 2016, which should cover everything. While all this is going on, of course, you can't take your eye off the ball in respect of other aspects of the build. In particular, the total cost of the pony assemblies remains unquantifiable and we need to raise funds for the motion – rods and valve gear – over the next year. This is likely to account for the best part of £100,000, so there are no grounds for complacency. I recently wrote out cheques for well over £40,000 in just one morning, which would have brought tears to the eyes of my Calvinistic ancestors back in nineteenth century Peeblesshire, and made me feel a bit sick: you can empty a flourishing bank account in a matter of moments! Fortunately, we remain in a healthy financial position, entirely thanks to our supporters. If you are one of them, please accept my heartfelt thanks on behalf of the 82045 Trust: we'd have long ago been dead in the water if it hadn't been for you. Instead of that, I don't think it's being boastful to say that we are regarded as one of the top handful of the current new build projects. Established income streams – standing orders, Gift Aid and VAT refunded – enable me to predict how our finances stand at any given time, which is vital for forward planning, so please do consider setting up a monthly standing order if you have not already done so. Gift Aid is a generous 25% on top of eligible donations so £5 per month is worth £6.25. They really do mount up, believe me. 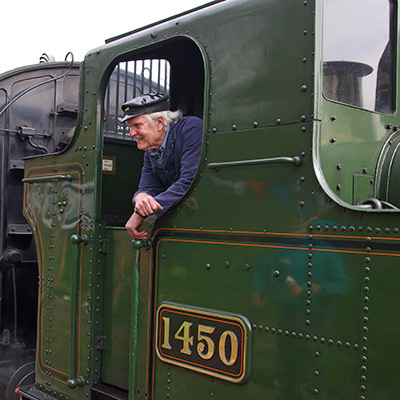 Furthermore, as Barbara explains later we offer a chance of a footplate ride to our supporters – see below for details. Both Steam Railway and Heritage Railway continue to give excellent coverage to 82045, thanks respectively to Clive Wheeler and Paul Appleton. Look out for an article in the forthcoming issue of SVR News. The magazine will also contain a “Never Again” appeal leaflet which we are hoping will give us a nice boost for the summer. Our target remains to recruit 10% of the SVR: at present between 6% and 7% of member households support us. Thanks as ever to Editor David Williams for his unfailing help. He recently grumbled to me (good naturedly) that he “might as well call the next issue 82045 News”, which sounds promising. We shall see! We didn't get any takers for the blower and ejector ring singled out last month, so if anyone would like to adopt this vital piece of kit, please do get in touch with Chris. Otherwise, we are delighted with the success of the sponsorship scheme. It is likely that individual items of 82045's motion will be offered over the next few months', so please look out for further details. Following on from The Eardington Explorer which raised some £5,000 for the boiler appeal in April, Bryan Clarke and his team met at Bridgnorth on 23rd May to discuss the possibility of running another special train next spring. We are at present waiting to hear from the SVR whether this will be possible, but in the meantime we can give you a few preliminary details: we would like to hire 1450 again and the train will be called The Eardington Thunderbolt after the classic 1952 Ealing film The Titfield Thunderbolt, in which engines of this class played a starring role. The train will again start from Bridgnorth, will run on a Friday, probably in April and this time will go as far as Highley (we can take water there) where there will be an extended stop, before running back to Eardington, which will again be the focus of the event. Full details will be published in due course, but in the meantime, if you would like to register your interest, please send Bryan a SAE. As well as your email address (if applicable), stating the number of tickets you would like to reserve. His email address is bryanclarke44@hotmail.com or he can be contacted by letter at 10A, Love Lane, Bridgnorth WV16 4HD or Tel: 01746 761783. For those of you who missed it, The Eardington Explorer was a lovely day out, with many people remarking on the relaxed unhurried feel to the day, possibly because there were no scheduled SVR services to worry about. The one imponderable is the weather and you can only keep your fingers crossed that it will play ball! Our 2015 winner was John Weaver who had a splendid day despite the “spring” showers. John made the return journey from Kidderminster to Bridgnorth on 6th May on board GWR 2-8-0 No.2857 with our own Tony Massau driving and Colin Gibson on the shovel. 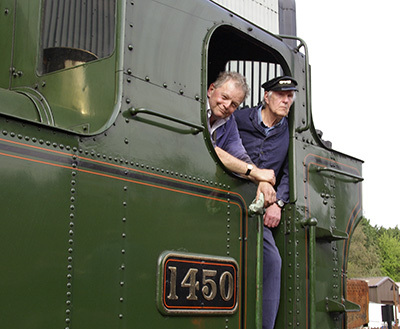 John commented later “The experience of running tender-first into the wind and rain, aboard a 'rough rider' was all part of a memorable day!”. A reminder that members who pay a standing order of a minimum £5 per month or join as life members are automatically entered into our annual draw to win a 32 mile footplate ride on the SVR. Just complete the standing order on our How to Help page and Barbara will do the rest. Thank you! The driver’s side of 82045 showing recently painted cylinder. Photo: Tony Massau. 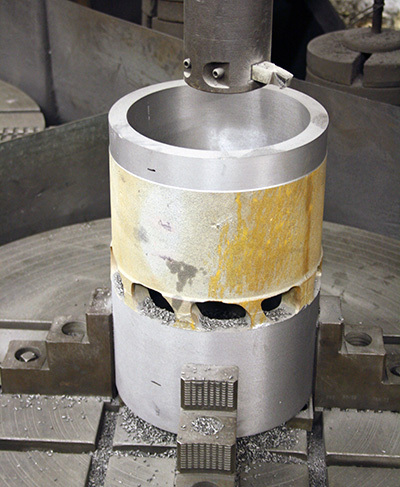 A steam chest liner being machined on the vertical boring machine. The nearly completed ashpan painted in primer. The driving wheels at Buckfastleigh with all crank pins fitted. Photo: Tony Massau. 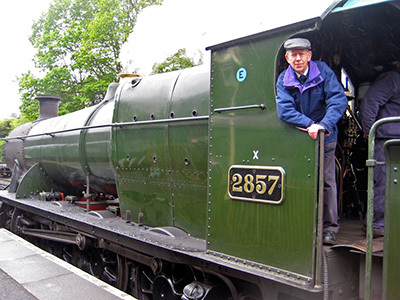 Our 2015 footplate winner was John Weaver enjoying his trip on board GWR 2-8-0 No.2857. Photo: Mrs J Weaver. Our relaxed crew on board this years' Eardington Explorer. Photo: Phil Gosling.